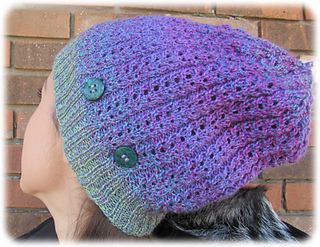 Let’s Do the Twist is a versatile, slouchy lace hat. It has a coordinating, button-in liner, so on those days when you want more warmth and less lace, you’re covered! Great for all seasons. 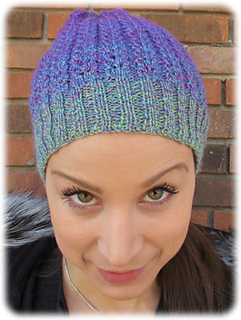 Made using Knit Picks luscious new Chroma Twist, the hat has an ever-changing gradient. Even the liner changes. It coordinates without reflecting the color changes in the hat exactly. Add two buttons to keep the liner in place, and voila! 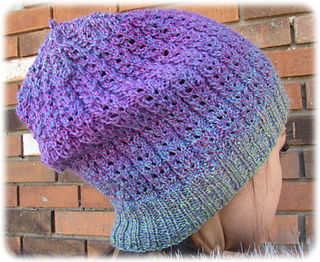 You have a comfy, warm, all-season hat. 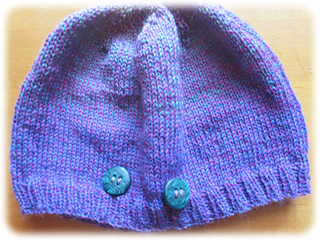 Also, the hat can be sized as you wish, and it’s machine washable. 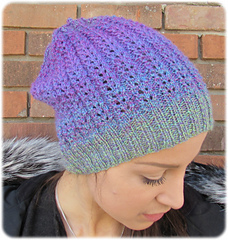 If you want a slouchier hat or fuller liner, you will want to order a second skein of Chroma Twist.